This is a fascinating overview of how the Netherlands transformed their transportation infrastructure for bicycling. One of the most interesting things to me is that it was partially in response to the oil crisis of the ’70s (which ushered in car-free Sundays in city centers). 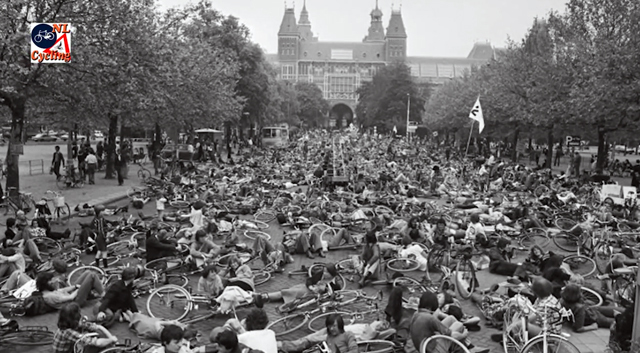 I especially love this image of protesters occupying Amsterdam’s Museumplein – which is now closed to automobile traffic. The other day, I took a different route to work, traveling via Market St. after taking The Wiggle (can I just say that I love the fact that SF has a well-known bike route called The Wiggle?) from the DMV. Market St. is probably the most heavily traveled bike route in SF, especially during the commute hours. And I must say, it was pretty great traveling in a pack of cyclists on the way to work (my usual route down Post St. is generally just me, cars and buses). As a cyclist it made me feel safer and more visible – and frankly it just made the ride more fun. Of course, just as with automobiles, there were a couple of jerks on bikes, who felt the need to squeeze past me at a red light so they could be 4′ closer to their destination. And this pack of cyclists obeyed all traffic rules for the entire trip, stopping at red lights and yielding to pedestrians – which, despite all of those who will shout their anecdotal evidence to the contrary, is more typical than not. I should also add that the traffic lights on Market St. are not timed for bikers, which seems ridiculous. And that on at least two occasions all 20 or so of those in my pack were forced to squeeze past double-parked cars dropping off a single passenger somewhere on Market St. Not only does this slow everyone down, it forces cyclists to interact too closely with buses and streetcars, as well as the treacherous tracks and grates in the transit lane. And this is all on top of the typical but no less dangerous potholes and half-assed repairs that make Market St. into an obstacle course for those on two-wheels. The current Better Market Street planning seems to be headed in the right direction. It will be interesting to see what actually gets built – though I’m hoping that (finally) Market St. is closed to private automobile traffic, with dedicated transit and bike lanes and improved sidewalks for pedestrians. We shall see.